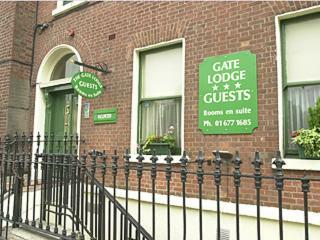 Located next to Dublin’s Phoenix Park, the Gate Lodge Guesthouse is a Georgian town house, 300 metres from Heuston Train Station. It offers comfortable rooms with TVs and home-cooked breakfasts. The bright and spacious rooms feature a work desk, telephone and tea/coffee-making facilities. They include a private bathroom with a shower, hairdryer and free toiletries. Traditional cooked Irish breakfasts are served each morning, using fresh local produce. Guests can relax in the sitting room, which has comfortable sofas and armchairs. The Guinness Storehouse and Richmond Park are 10 minutes’ walk away. There is a Luas stop at Heuston, which provides easy access to the city centre, whilst there is a bus stop less 5 minutes away, which has a direct route to Dublin Airport.